Partners in Compassionate Care (PCC) is a Faith-based Non-Profit Organization founded in 2004. In 1987, during the Second Sudanese Civil War, Deng fled his home in Bor County, becoming one of the nearly 30,000 Lost Boys of Sudan. He spent his formative years among refugee camps in Ethiopia and Kenya, learning his letters and numbers on a dirt floor. Nearly fourteen years later, in 2001, Deng was relocated to San Jose, California. He worked tirelessly to support himself and friends still in the refugee camps, all while pursuing a Bachelor of Science at California State University and then a Master’s in Public Health from Touro University. Deng began working for Partners in Compassionate Care in 2011 as the Administrator for Memorial Christian Hospital, which grew tremendously under his leadership. He now works as the Executive Director and has lead PCC to create three more clinics in rural South Sudan to treat the local peoples. Deng’s passion to give back to the community does not stop in South Sudan. He travels across the Unites States sharing his life experiences with young people to inspire them to overcome challenges and be involved in their local communities. He has also written a children’s book A Story of Hope - The Journey of a Lost Boy of Sudan. 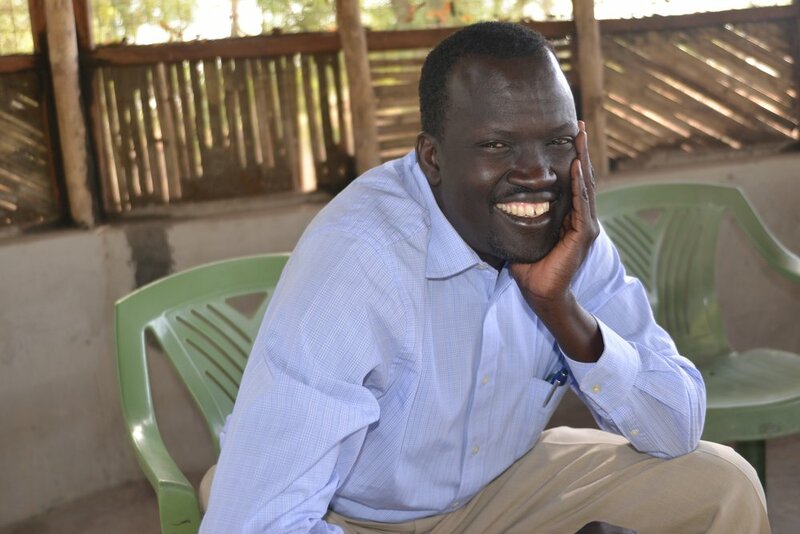 If you would like Deng to speak about his experiences or the medical need in South Sudan at your high school, middle school, church, or other community event you can contact Deng at djongkuch@pccsudan.org. In 2004, a group of nine people visited Werkok in South Sudan on the invitation of South Sudanese church leaders to assess medical care in Southern Sudan. Some of the group had served as parents to Lost Boys and Girls of Sudan who came to Grand Rapids. What they saw in South Sudan was unbelievably poor living conditions and nearly nonexistent health care, but they also saw amazingly vibrant Christian churches and returned both overwhelmed with sadness and filled with joy. As a response to their experience, the group formed Partners in Compassionate Care as a spiritual vehicle to bring hope and healing through medical services to the people of South Sudan. They model their actions on the teachings of Christ, and their mission is to provide hope and healing for the people of South Sudan by partnering with like-minded organizations and individuals. Dedicated in 2009, Memorial Christian Hospital provides both inpatient and outpatient services, a surgical theater, imaging (Ultrasounds and X-ray), pharmacy, laboratory, immunizations, agricultural demonstration farms and spiritual care. Since its founding, close to 100,000 South Sudanese have been treated and over 2000 surgeries have been performed. People in the village of Werkok donated 40 acres of land for the hospital buildings’ construction. The once grassy field near this rural village is now Memorial Christian Hospital, a 24-bed hospital that employs people from South Sudan. The hospital is also expanding by opening Satellite Clinics to serve the rural population. The first Satellite Clinic is located in Malek Village along the River Nile. The second is in the town of Bor. The third is in the village of Athooc. The long-term goal is to make Memorial Christian a self-sustained, local NGO that provides healthcare services to the rural population in Bor County. The Satellite Clinics are expected to be self-sustaining within the first few months of their operation, a process modeled after how Dr. Daniel Fountain brought health services to thousands of people in rural areas of the Congo. Partners in Compassionate Care (PCC) exists for the purpose of providing Christ-centered hope and healing to the people of South Sudan. To enable the South Sudanese to own and operate Memorial Christian Hospital (MCH) and its Satellite Clinics on a sustainable basis, with appropriate governance and support. Christ-Centered—We will care about their physical and spiritual needs. Community-Driven—We will focus on the needs that matter to them, not just to us. Sustainability-Focused—We will create self-sufficiency, not dependency, and do so responsibly. Enabling—We will come alongside and enhance their skills and capabilities. Support our mission and values, and will not work against us. Demonstrate a spirit of partnership, evidenced by mutual respect and unity of purpose. Work to promote reconciliation and community among the South Sudanese.